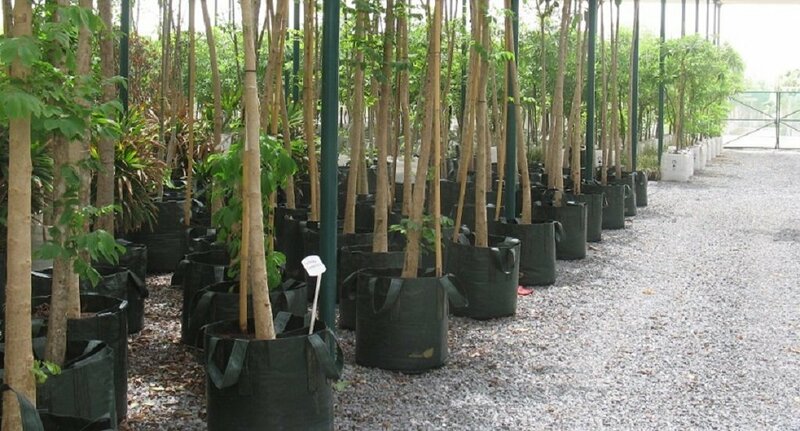 Until 20 years ago, all trees were grown in hard plastic pots or film grade poly bags and at the time there was no such product as a very strong planter bag with handles. This was always a big problem for production nurseries as lifting plastic pots or planter bags increased the risk of back injuries to workers which in turn increased the cost of insurance premiums and workers compensation claims. In 1992 Steve Turner, owner of Wangara Horticultural Supplies had several meetings with Australia's largest nursery to try and find a solution to this ever increasing problem. It was then that the first trials of the woven planter bags with handles were done and after one spring and summer season, the trial stock was inspected. To everyone's amazement we found that the trees had a far healthier root system than others grown in hard plastic pots. We now had a far superior product. This new planter bag was developed with handles to assist in lifting with an added bonus of the superior root formation that all but eliminated root spiralling. In 2004, WHS decided to change the configuration of the planter bag from a commodity type of bag that was difficult to fill and retain a perfect cylindrical shape, to a round bottom bag with UV additives. The Easy-Fill™ planter bag was conceived and patented to include all the aspects of the 8 year research results. UV additives were included in the fabric, thread and handles to extend the life of the Easy-Fill™ planter bag. The Easy-Fill™ planter bag could now hold up in the harshest climates, from the sub-zero climate of the European winter, to the driest and hottest conditions of the Middle East. WHS Australia has recently expanded to include new investors Geoff and Lina Stowe. They will be joining Steve Turner, innovator of the Easy Fill™ woven planter bag. Steve is well known and respected in the Horticultural Trade for his industry knowledge, quality products and long term customer relationships. WHS Australia remains committed to providing the highest quality products that its customers have depended on for almost 20 years.